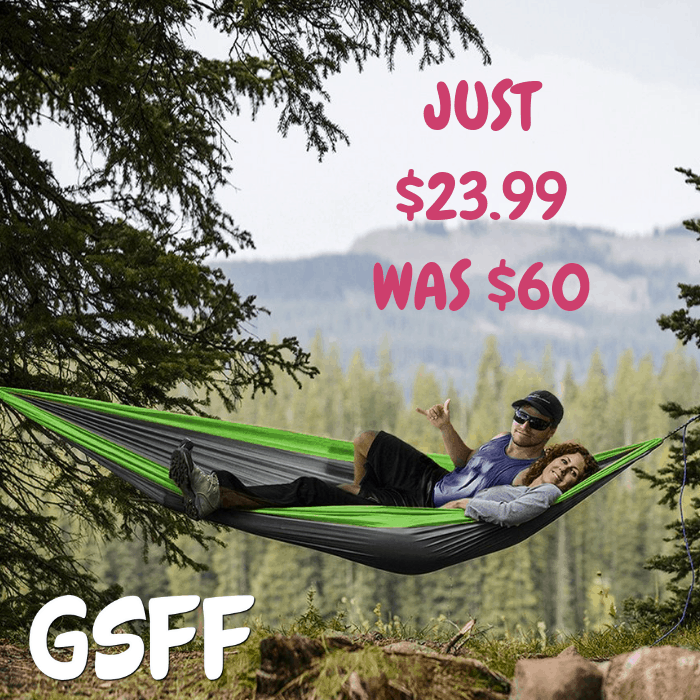 2-Person Hammock Just $23.99! Down From $60! FREE Shipping! You are here: Home / Great Deals / 2-Person Hammock Just $23.99! Down From $60! FREE Shipping! Until December 9 only! Proozy is offering this 2-Person Portable Hammock for just $23.99 down from $59.99 when you use promo code CAMP20 at checkout for an extra 20% off! PLUS, it’s FREE shipping! This hammock is mad of high-quality, high-strength, breathable parachute nylon fabric. This soft yet strong material provides the most comfortable relaxation while enjoying the outdoors or just in your backyard. The fabric is light, quick-drying, durable and machine washable. The hammock can provide relaxing support up to 400 lbs. The hammock has enough space to hold your body comfortably yet have enough material leftover to cinch up like a protective cocoon. The hammock is portable and can be folded-up into its own carrying sack.